www.Tuolumne-Rivers.com was designed to serve as a public resource to the whitewater rafting community. The content in this website is intended for use by experienced whitewater rafters. This site features whitewater rafting access & shuttle directions and river descriptions including a mile-by-mile guide. www.Tuolumne-Rivers.com also provides information about camping, conservation, and permit requirements for the Main Tuolumne and Cherry Creek whitewater rafting runs. 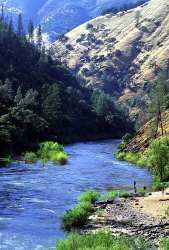 Portions of Tuolumne-Rivers.com were excerpted from California Whitewater, written by Jim Cassady and Fryar Calhoun. Excerpts were also taken from The Best Whitewater in California by Lars Holbek and Chuck Stanley. Unless otherwise specified, all content provided on this site is for your personal and non-commercial use. You may not modify, copy, distribute, transmit, display, perform, reproduce, publish, license, create derivative works from, transfer, or sell any information, products or services obtained from the Tuolumne-Rivers.com website, or any affiliated content provider, without express permission from the original authors.